Acrobatic gymnastics is one of the form of Gymnastics. Acrobatic gymnastics is performed by groups or pairs. This article gives you more information about the events and components of the Acrobatic gymnastics. Judges and Judging of Acrobatic gymnastics are also quoted in this article. Acrobatic gymnastics is a part of Gymnastics which is played with music and dance. Acrobatic gymnastics is an art which need strength and flexibility in performing. Individual performance is not allowed in Acrobatic gymnastics. This form of Gymnastic is performed with pair or group. Different styles and techniques of dancing are included in Acrobatic gymnastics. Balance, Dynamic and Combined effort together makes Acrobatic gymnastics more interesting and beautiful. There should be great balance between pairs or groups to perform amazing skills in Acrobatic gymnastics. Dynamic means ability of a pair or group to perform against the slow or fast music. combined efforts of both balance and Dynamic can create a good Acrobatic gymnastics performance. There will be different judges in Acrobatic gymnastics to look after each performance and events. There will be Difficulty judges who are appointed to look after the difficulty of the performance. Execution judges are there who look after routine technical faults. Artistic judges will judge performance merit of the routine. One judging panel with 3 to 4 judges will look after the pair performance in Acrobatic gymnastics and other panel look after the Group Acrobatic gymnastics. There are three components in Acrobatic gymnastics where scores are given on the basis of these components. 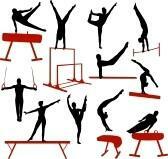 Scoring of Acrobatic gymnastics is done out of 30 and 10 with the following conditions on each component. 1) Artistic component: Here the scoring is done by evaluating choreography, diversity and ability to perform against the music given. 2) Execution component: In this component scoring is done on the basis of performance done by partner and Individual talents. 3) Difficulty component: Difficulty component is judged and scored on the basis of difficulty degree and number of skills performed.